Redshirt junior guard DJ Williams makes a drive for the basket during a game against Howard earlier this month. A stagnant second half for men’s basketball against Harvard translated into a double-digit loss in GW’s final nonconference road game Saturday. The Colonials (3–9) went point-for-point with the Crimson (5–5) thanks to aggressive drives to the basket to open the contest but struggled to remain close as Harvard’s man-to-man defense smothered further efforts. The Crimson ran away with the game in the second half to clinch a 75–61 victory. GW allowed Harvard – a team that averaged 7.9 offensive rebounds coming into the afternoon – to grab 10 offensive boards in the first half alone. Harvard finished with 19 offensive rebounds that turned into 17 second-chance points. The Crimson also outperformed GW on the boards overall, tallying 47 rebounds to the Colonials’ 29. Sophomore guards Justin Mazzulla and Maceo Jack were the only GW players to record double-digit scoring totals, dropping 11 and 10 points, respectively. Freshman forward Marcus Littles also added a career-high seven points to the Colonials’ total. The Crimson were led by freshman guard Noah Kirkwood, who picked up 20 points and dished out six assists on the day. Junior guard Justin Bassey collected 13 points for Harvard and snatched eight rebounds. Redshirt junior guard Armel Potter, who sat out five prior contests due to injury, appeared in his first game since Nov. 24. He subbed in for the Colonials with less than 10 minutes to play into the first half and finished the game with five points in 12 minutes of action. The Colonials also faltered from the free-throw line, going 9-for-20 in the game, which Joseph said has been a key weakness in the team’s losses all season. GW ended the matchup shooting 46.0 percent from the field, including 28 points in the paint. To open the game, GW’s zone defense honed in on Harvard’s offense and forced the Crimson to turn the ball over multiple times. With both teams tied at 13 points apiece with just under 10 minutes left in the first half, redshirt junior guard DJ Williams scored on two-straight GW possessions to give the Colonials a four-point lead, their largest of the day. But Harvard went on its own run and took back the advantage a few minutes later after back-to-back three-pointers. Foul trouble hindered the Colonials early, with sophomore guard Terry Nolan Jr. and Jack each earning their second fouls with 11 minutes still to play in the first half. Sophomore forward Javier Langarica and junior guard Adam Mitola also picked up their second fouls of the night before the half was over. Harvard went into the locker room leading the Colonials 39–28, the Crimson’s largest lead as of that point in the game. The Crimson entered the second half the same way they left the first, continuing scoring with ease. GW struggled to keep up with Harvard’s offense, which went on a 10–1 scoring run in the first five minutes of the half to pull ahead 49–29. A layup from Potter at the 15-minute mark broke GW’s scoring drought and put him on the scoreboard for the first time in nearly a month. 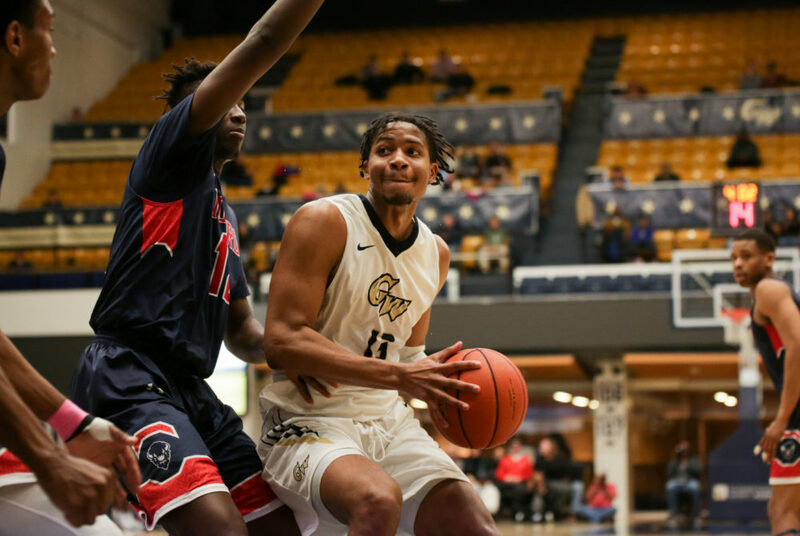 The Colonials faltered from the three-point line, going 0-for-5 in the opening frame until freshman guard Shandon Brown drained GW’s first shot from deep about six minutes into the second half. GW finished 6-for-15 on the night from beyond the arc, while the Crimson sank 10 of their 30 three-point attempts. GW came within 13 points of Harvard on three occasions in the second half, but could not bring the deficit below 10. The Crimsons’ largest lead was 22 points with only a few minutes to play, but the Colonials ended the game with three-pointers from Potter and Mitola coupled with a layup by Jack to lessen the rout. The Colonials take on American at home next Saturday after a week of rest. Tipoff is scheduled for 2 p.m.